Comments - Terrific illustration of Act 4 from the kabuki play "Kanadehon Chushingura," based on the true story of the 47 ronin. Here, Yuranosuke stands outside the palace holding the dirk with which his master, Lord Hangan, has just committed suicide. 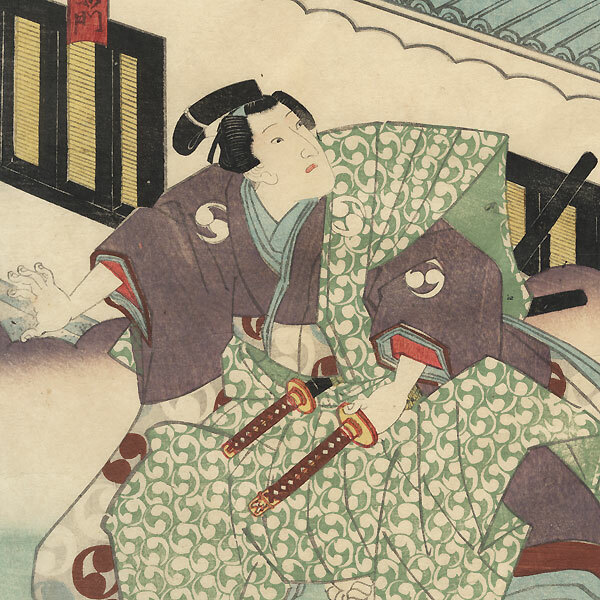 Yuranosuke looks up with a tight-lipped frown, vowing to avenge Lord Hangan's death. 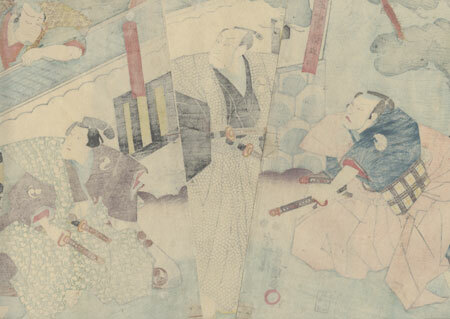 His young son, Rikiya kneels at right, an alarmed expression on his face. A border of clouds separates the figures from a view of the palace wall, with a rather sheepish samurai looking over the top at right. A handsome design with expressive figures and fine bokashi shading. Condition - This print with excellent detail as shown. Three separate panels. Slight paper remnants on reverse at corners from previous mounting. A few small holes, slight thinning at corners, repaired. Slight toning and soiling, a few creases and stains. Please see photos for details. Good overall.